These are tough times, and many businesses will be forced to make do with less staff and, in many cases, the resulting excess space. In the face of this challenge, office leaders can make changes to improve the way their employees work. Small and creative positive changes today could have long-lasting impacts on worker productivity and corporate profitability for years to come. The I-15 Corridor in San Diego is a market that has experienced a substantial surge of growth and development over the past few years. Even with restrictions on multi-tenant office development imposed by the city, the area has flourished as a corporate business hub, with many medium- to large-scale companies expanding and relocating their headquarters or operations to this region. Modern construction techniques are being profoundly altered by the convergence of the three most influential process changes of the current decade. A new concept -- Project Integrated Delivery -- combines lean construction methods, Building Information Modeling software analysis and LEED green building standards to set a new benchmark for defining the best commercial buildings. Because of the global economic downturn created by years of systematic lending abuse, the San Diego commercial real estate market, much like commercial real estate markets across the nation, is now experiencing a noticeable decrease in investment transactions. However, San Diego remains a popular place for businesses due to its great location, pleasant climate and strong local economy. James Lawrence, CEO of Ecolite Concrete, saw the immense potential in the eco-friendly wall system when he evaluated the company as the CTO of a hedge fund in 2007. This convinced him to come on board, first as its director of technology and more recently, in June this year, as its CEO. What is the retail landlord to do? It seems like there is a never-ending stream of bad news affecting the retail sector. NEW YORK (AP) -- NorthStar Realty Finance Corp. (NYSE: NRF), which invests in commercial real estate debt, posted third-quarter results that beat Wall Street expectations, despite turmoil in the credit markets. Underscoring the deepening woes in commercial real estate, a high-profile British developer has defaulted on a $365 million loan for prime land it bought in Beverly Hills last year as part of a plan to build luxury condominiums. One year ago, just as the credit doors were swinging closed, Blackstone Group LP (NYSE: BX) succeeded in pulling off one last deal and it was a beaut: The $26 billion leveraged buyout of Hilton Hotels Corp., with its 2,900 hotels and 490,000 rooms throughout the world. Cushman & Wakefield announced that Steve Rowland and Michael Roberts have joined the company's San Diego office, where the accomplished real estate professionals will fill a vital niche as office and industrial investment sales specialists. Voit Commercial Brokerage is poised to be an industry leader in the retail marketplace to secure national retailers for the region's largest retail developments, as well as assisting top retailers seeking new sites to expand their presence in San Diego. Since the upfront installation costs of solar energy systems can be daunting but interest in solar is growing, two methods to finance these systems are becoming popular: solar power purchase agreements (PPAs) and solar financing districts (SFDs). Green real estate grew out of corporate America's adoption of the Triple Bottom Line system (3BL) of corporate accounting: people, planet, profit. From Wal-Mart (NYSE: WMT) to Citigroup (NYSE: C), America's largest, most respected firms now address social responsibility (people) and sustainability (planet) alongside profit in their day-to-day operations. This expansion of corporate accountability has spawned a new breed of corporate officer -- the director of sustainability -- who is focused on finding ways to reduce the firm's carbon footprint and strengthen its public image. For biotech and life science companies looking to lease space in San Diego, there is good news and bad news. The good news is that the soft office leasing market means great deals for tenants who seek non-laboratory space. The bad news is that available lab space is at an eight-year low, making it more of a landlord's market. The first big wave in the green building industry began in 2000 when the U.S. Green Building Council launched the Leadership in Energy and Environmental Design for New Construction (LEED NC). It took another four years to develop a pilot LEED rating system for the current portfolio of buildings -- LEED for Existing Buildings (LEED EB). After several years of working with the LEED EB system and refining it to provide the sought-after value, the new LEED Existing Buildings: Operations and Maintenance was launched in February. The continuing effects of the depreciating housing market and fallout on Wall Street is being reflected by a steady decline in consumer confidence, which in turn is translating into slower office and industrial leasing activity as well as the postponement of new projects, a just released study by Cushman & Wakefield shows. Clients are looking at long-term investments, seeking more value and a reduction in operating expenses, and retaining tenants in the current market conditions, according to several property managers that the Transcript spoke with recently. The darling of the Urban Land Institute/PriceWaterhouseCoopers Emerging Trends in Real Estate survey just three years ago, San Diego fell to the middle of the pack for 2009 among big cities contending for the title of best place to develop and invest in real estate. When some people read "real estate crisis," they automatically think of the hundreds of thousands of homes across the country in distress. 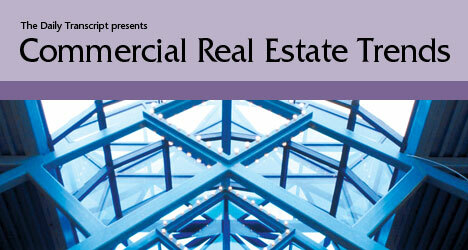 However, there is another sector of the market feeling the repercussions of the subprime mess: commercial real estate. Lean times for contractors are probably here for at least a year, but there may be opportunities beyond the pain. Life science space in San Diego remains at a premium even in soft economy. WASHINGTON -- U.S. commercial property investors expect losses next year for the first time in almost two decades as companies cut jobs and the economy slows, an industry report said. While retail vacancy has moved up in the past year, it is still expected to remain low with the soft economy. NEW YORK -- Hotel companies, which have been struggling all year with reduced travel demand and tight credit conditions, are now facing a new challenge: how to conserve capital. Kearny Mesa-based GMI Integrated Facility Solutions is an eclectic firm capable of constructing tenant improvements, supplying security services, managing buildings, maintaining them and cleaning them as well. The Daily Transcript partners with USD's Burnham-Moores Center for Real Estate and Urban Land Institute -- San Diego to present this annual overview of our local commercial real estate landscape. This section offers expert advice from the region's leaders regarding the latest industry trends, issues and market predictions.